History Workshop Online has launched an online exhibition of material from the archives of the History Workshop movement, held at Bishopsgate Institute in London. 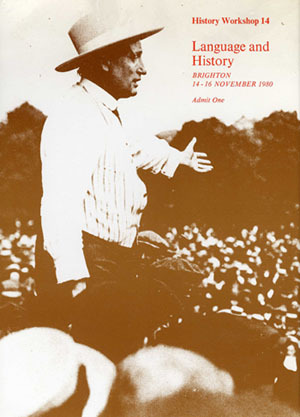 The exhibition includes images of documents from the twenty-eight History Workshops that took place between 1967 and 1994, along with digitised versions of thirteen History Workshop pamphlets. The text describing the Workshops was written by Luke Parks at Bishopsgate Institute, with input from members of the History Workshop Journal editorial collective, in particular Anna Davin, and supported by funding from History Workshop Journal. Below, Barbara Taylor considers the rise and fall of History Workshop. History Workshop was a popular movement for the democratisation of History which flourished in Britain from the late 1960s to the mid 1980s (with sporadic activity continuing into the 1990s). It emerged from Ruskin College Oxford where Raphael Samuel, the movement’s initiator and presiding spirit, taught history for many decades. In the course of the 1970s History Workshop spread across Britain, spawning dozens of regional and local initiatives, publishing many books, pamphlets and journals (including the still-extant History Workshop Journal), and acquiring influence throughout intellectual and educational circles. During these years the movement also went international, spawning sister workshops in Germany, France, Italy, South Africa and America. Its high point was reached in the late 1970s, and thereafter it went into a slow decline, although many of the developments it helped to foster (such as oral history and women’s history) continue to flourish today. The early workshops were Ruskin-based, participant-led events that drew on what Raphael Samuel described as a ‘fluid coalition of worker-students from Ruskin and other socialist historians’. 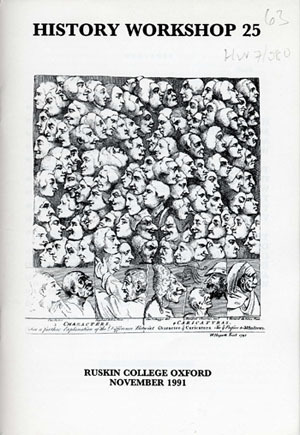 The first one, ‘A Day with the Chartists’, held in 1967, was a modest affair with about 50 in attendance. But five years later a workshop on ‘Workers’ Control’ attracted over 700 and by the mid 1970s the workshops had become major festivals of history, attracting up to a thousand participants. While the themes explored varied widely, the events were primarily a showcase for history seen from a non-elite perspective, ‘people’s history’ as it was labelled. In the early years this meant primarily working-class history but over time, after some controversy, it expanded to include the new women’s history, for which the History Workshops were the primary seedbed. Why did History Workshop happen? Individuals certainly made a difference: Raphael Samuel, Anna Davin, Alun Howkins, Sally Alexander…it is impossible to imagine History Workshop without these men and women, whose names recur again and again in the documents here. But the context was crucial. Britain in the 1960s was a turbulent society. Trade union militancy, the student movement, the New Left: these and other outgrowths of popular discontent fuelled the desire for a new kind of History. Britain’s long tradition of adult education, dating back to the industrial revolution, was also a vital factor, as was the influence of the Communist Party Historians Group with its line-up of stellar figures including E P Thompson, Christopher Hill, Dorothy Thompson, Eric Hobsbawm, and Raphael Samuel himself before he left the Communist Party in 1956. The CPHG’s brand of leftwing history left an indelible mark on History Workshop, even though many History Workshoppers had little sympathy for the communist tradition. By the early 1970s the Women’s Liberation Movement had also become a key element in History Workshop, as under its influence women sought to uncover ‘hidden’ histories of women’s lives and gender inequalities. British feminism was unusual in the preponderance of historians among its writers and thinkers, which was probably down to the strong presence of History Workshop in radical circles at the time. Why did History Workshop die? It is impossible to answer this question briefly, but certain factors were obviously important. The rise of Thatcherism; the decline of organised labour; the collapse of a popular Left; the intellectual challenges posed by European Marxism: by the 1980s all these were undermining the leftwing populism which had been at the heart of History Workshop. Who exactly were ‘the people’ to whom History Workshop sought to give voice? In the movement’s first decade this was the working class, which was assumed to be an inherently progressive force. But by the beginning of the movement’s second decade this idea was in tatters. The rise of feminism inside History Workshop had portended this change, which then received negative reinforcement from working-class support for Thatcherite conservatism. But other changes were important too: the expansion of higher education, which undercut the movement’s anti-elitist critique of university history; the subsequent move into the academy of many varieties of history which History Workshop had nourished, including women’s history; and, very importantly, the emergence of new radicalisms–the gay and green movements, anti-racist and postcolonial politics–that did not fit easily under the History Workshop umbrella. No doubt other factors were significant too, but the history of History Workshop is still largely an untold story, with much that remains to be investigated and understood. Hopefully the publication here of documents from the movement, from the wonderfully rich archive held at Bishopsgate Institute, will prompt a new generation of historians to turn their attention to this important moment in Britain’s radical past. Dennis Dworkin, Cultural Marxism in Postwar Britain: History, the New Left and the Origins of Cultural Studies (Durham, NC: Duke University Press, 1997). Raphael Samuel, ‘History Workshop, 1966-80’ in Raphael Samuel (ed. ), People’s History and Socialist Theory (London: Routledge & Kegan Paul, 1981). Bill Schwartz, ‘History on the Move: Reflections on History Workshop’, Radical History Review, Vol. 57 (1993).